If there is any corrections or new ideas and suggestions that need to be made please E-mail me, or if there is anything that you oppose to, I would gladly like to be corrected and have more ideas. The_Rice_Paper@Hotmail.com, thank you everyone! Do you want to know how to get this job? Looking for a forum to discuss Samurai issues? I would suggest to have Acc/Atk gear on at the most part of battle, then macro a switch to as much STR as possible before using a WS. Skillchains can be very confusing, but if you wish to be a Samurai, you better know it well. It is what we do best. Lv. 10 - Provoke: Increase Emnity for mob, can be used when temporarily tanking if tank is dead or AFK. Lv. 15 - Third Eye: Pulling, temporary tanking, or life or death moments by giving Samurai a single chance to dodge a physical attack. Lv. 30 - Berserk: Increase power of WSs or regular attacks, adding attack power to Samurai. Lv. 30 - Meditate: Revolutionary ability which gives Samurai 100% TP in a time span of 5 seconds. Lv. 50 - Defender: Pulling or temporary tanking this may come in handy, increasing the defense points. Lv. 70 - Warcry: Adding more attack power along with the PT members in range of area of effect(AoE). Lv. 10, 50 - Resist Blind Trait: When blind is casted on Samurai, there will be more of a chance to resist it with this trait. Lv. 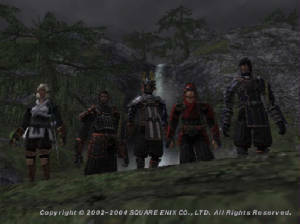 10, 30, 50, 70 - Store TP: Giving Samurai the edge with TP, having TP return from Great Katana like no other job in FFXI. Lv. 40 - Demon Killer: Will come in useful when fighting the 3 demon NMs for Myochin Kabuto(AF3), making Samurai more effective against demons. Lv. 20 - Defense Bonus: Kicks in worthy when Samurai must temporarily tank. Lv. 60 - Attack Bonus: Giving more effectiveness when using SCs and regular physical attacks. Lv. 30, 70 - Resist Virus Trait: Help resistance against Virus when casted on. This is a very popular subjob for Samurai. 90% of Samurai will have this particular subjob. For one it is very easy to level from 1-30. This sub can be used Lv. 1-75 Samurai. It has most nessecities that Samurai could ever need. Attack bonus, Defense Bonus and Double Attack, all coming in handy for a Samurai. Provoke can be used in early tanking and for temporary tanking in the higher Levels. Berserk and Warcry to add to Samurais lack of attack, Defender to add to Samurai's lack of defense, Defend can also be useful when being the Trick partner for THF, DRK, etc, adding more defense and preventing the Samurai from dying. Last but not least would be Double Attack, gaining extra TP for the Samurai. Sam/War's effectiveness takes form morely throughout 65-75, when performing Lvl. 3 SCs which becomes a major part in 65+ PTs with two or more SC partners. Throughout regular hits the damage will be greater, but WS damage will be less then SATA WS damage. Lv. 10 - Steal: Steals a single item from mobs, can come in useful when farming or getting rare items when EXPing. Lv. 30 - Sneak Attack: Giving a critical hit from behind the mob, can help when adding extra damage to WSs and regular attacks. Lv. 50 - Flee: Increaseing movement speed, making traveling faster and avoiding aggresive mobs. Lv. 60 - Trick Attack: Critical hit behind mob and another character, by making them able to take extra damage and to be a damage controller for the PT. Lv. 70 - Mug: When farming or EXPing a certain amount of gil may be stolen from the mob. Lv. 5 - Gilfinder: When killing Beastmen gives more gil drop rate. Lv. 20, 60 - Evasion Bonus Trait: Hightens evasion, may help when pulling, farming, or temporarily tanking. Lv. 40 - Resist Gravity Trait: Help from slowing down the character's movement. Lv. 30 - Treasure Hunter: Helps when farming or finding a specific item(s). This combo is a very nice one because of the farming benifits and Sneak Attack/Trick Attack(SATA) in higher Lvs. Thief sub is not chosen as often, due to the fact of actually leveling the Thief, Lvs. 1-15 experiencing takes a bit more time than the other jobs, particularly because of a lack of strength and abilities THF has during these levels. Later on this subjob pays off well, giving Samurai, Treasure Hunter and Steal for better farming. SATA can be very useful for taking extra damage with WSs and hate control in PTs. Although the WAR sub may do more damage by regular hits, the WS aided by SA(TA) is very large in numbers and can help the PT with damage controle. SAM/THF is prooves very effective after Lv60, when you will be able to start using Trick Attack and Tachi: Yukikaze, Gekko, and Kasha will take much more damage then previous WS with SA. THF sub will also be best used fighting Gods in Sky (Genbu, Suzaku, Byakko, Kirin) to see yourself finally breaking the 1000 damage range with Light and Darkness SCs (being properly equipted with STR). Lv. 2 - Sharpshot: Raises ranged accuracy, can help when using Sidewinder and Samurai's lack of ranged accuracy. Lv. 20 - Scavange: Finds stuff burried underground, not very useful to Samurai. Lv. 40 - Camouflage: Giving Samurai something similar to Invisible spell for a limited time, can be useful to find coffers or certain quest/missions which require invisiblity. Lv. 60 - Barrage: Adds 1-5 more shots to your ranged attack, can also be compared to as a second Meditate for Samurai. Which may aid in more TP return. Lv. 10 - Alertness Trait: Giving Samurai a chance to be less detected from mobs, useful when pulling. Lv. 20, 60 - Accuracy Bonus Trait: Giving Samurai what they need most, accuracy, increaseing for a small portion. Lv. 30 - Rapid Shot: Enabling Samurai to use Bow more frequently, having less delay on the Bow, which may aid in TP gaining. Lv. 40 - Resist Poison Trait: Increase the resistance against Poison when casted on. This is an awesome subjob for Samurai. Awesome bonus traits, extra abilities to build TP, seeming to be the perfect subjob for Samurai. Having Accuracy Bonus for Samurai's lack in Accuracy and Resist Blind to help against being blinded which makes Samurai decrease in thier terrible accuracy as it is. And Samurai being 2nd best in bow usage(C-). Barrage which is commonly refered to as a second Meditate, and percieved to build more TP than Sam/War or Sam/Thf. The biggest reason Samurai sub Ranger, is for Sidewinder. Knowing Sidewinder takes mass amounts of damage, and gaining large amounts of TP making this subjob even harder to resist. Although, I would only suggest using this as a subjob in PTs 1-64 or fighting Higher Notorious Monster (HNM) in Sky. 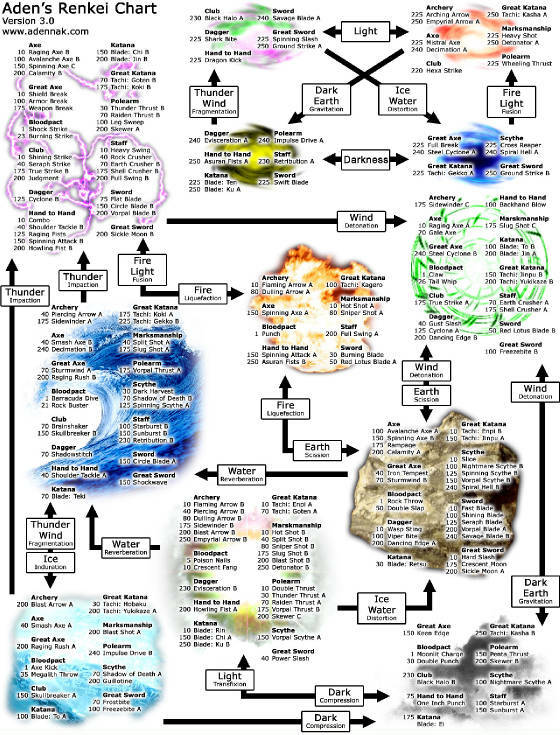 The reason being, WSs at skill level 225+ (e.g. Tachi: Gekko or Tachi: Kasha) plays a very big part in PTs 65+, Doing Lv. 3 SCs(Lv. 3 SCs can only be performed using 225+ WSs). Fact being Sam/Rng lacks Arching Arrow and Empyrial Arrow which obstructs Sam/Rng from participating in Lv. 3 SCs. Overall Sam/Rng is a very fun subjob to have(1-64), but at Lv. 65+ a Samurai must rely on the versitality of thier Great Katanas, not Sidewinders from bows. Mobs 60+ become very evasive and hard to hit, and the discription of Sidewinder is: Delivers an "inaccurate" attack that deals quadruple damage. Therefore having Samurai focus on Rng. Accuracy, and neglecting Accuracy. Again ignoring "Samurai's weapon", the Great Katana. But RNG sub is very useful in Sky HNM, for they can easily replace a RNG to spam arrows (w/ capped Archery). This subjob I would only reccomend for SAMs 74+ and after obtaining Utsusemi: Ni and Ichi. This sub used in lots of Earth HNM battles, if there for some reason a lack of tanks/ninjas. High damage job subbing Ninja can replace the tank. Samurai, having high damage rate, Meikyo Shisui, Third Eye, and third highest evasion in game, can tank most HNMs very well. Third Eye will give SAM an extra blink shadow to aid in casting Utsusemi. Meikyo Shisui and damage rate of Samurai can have them hold hate much better then a regular Ninja. These jobs i have further to research, and if anyone has any input for these subjobs or any other, please send them to The_Rice_Paper@Hotmail.com, I would greatly appreciate any help I can get. Ok, i feel the need to speak on this issue since SAM/MNK is my main combo. Keep in mind that this is only my opinion. My Samurai is lvl 59, and my Monk is lvl 32. And i believe that Monk is a very good sub for Samurai. First lets look at the exp situation: As far as Boost goes, no, its not something that you want to do throughout a fight, but when used before a weapon skill, it does make a relevant difference in damage(And it also does not take a from your defense). Im not too familiar with Berserk, since my Warrior is only lvl 10, (maybe someone can tell me the exact stats on Berserk) but i can say that the recast time on Boost is 15 seconds. The Samurai's job in an exp party to be a damage enhancer, because we can skillchain with just about everybody. Lets say for example there are 2 people in my party i can skillchain with and they are both near 100 tp. With a 15 second recast time on Boost, that means i can build up TP, Boost and then us my weaponskill for skillchain, Meditate, and when the next person is ready Boost and skillchain with them too. Now lets talk about Dodge. During battle, you prolly wont use Dodge if you have a good tank. But when your tank cant keep the hate, im sure no one would frown at extra evasion. But the main use for Dodge in exp party to me is when i am pulling. I find myself pulling in a lot of my parties because i usually have the highest HP in my party unless there is a Monk. And i can tell you from experience that 3rd Eye combined with Dodge does make a difference, even against IT mobs. Focus seems to be the ability that everyone agrees is a plus from subbing Monk, so i wont talk much about it. I do want to say though that while no accuracy up ability is a replacement for a life belt and accuraccy rings/earrings, imagine that ability PLUS that equipment^^. Also, i've noticed a lot of people saying that you cant double attack with Monk sub like you can with Warrior sub. I'd just like to inform everyone that you can double attack with Monk sub. When you have AF gloves equipped and use a riceball (i use tonosoma, not sure about the others) you can perform double attack also. It's my understanding that double attack is a passive trait for warrior, so im not sure how often it happens in comparison to using riceballs with AF gloves. Granted you will not be able to double attack until you get AF gloves, but it is possible without subbing Warrior. So in theory, you can double attack with any sub. Also when you get AF gloves and use a riceball, it enhances your accuracy quite a bit, top that with Focus and say a bard melee accuracy song, you rarely miss the mob. In terms of farming, Thief sub is obviously the best choice for that because of treasure hunter and gilfinder. But Monk sub does have its advantages. The max HP boost means you can farm longer before stoping to heal, you also tend to counter attacks of "too weak" or "easy" prey more often, killing the mob quicker. A "too weak" mob is gonna miss you most of the time anyway, but when u use Dodge, its like the mobs are swinging at air, again decreasing your healing downtime. Just as an example, when starting will full HP, i can farm an entire stack of black tiger fangs in Batialla Downs without stopping to heal once. This I've seen around and would like to hear some input from experienced people who have tried this subjob for Samurai. Having lots of attack bonus, although I'm quite sure the subjobs I have already explained are much better then these. From the update before Chains of Promethia came out. I've heard many rumors about this subjob being good for a Samurai. 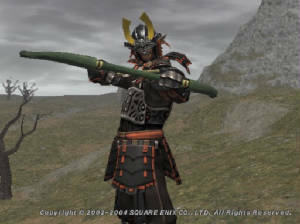 The fact being that the Summoner's avatars are able to use thier WSs every 1 minutes, enabling Samurai(with proper equipment) to SC with thier avatars every minute. It sounds a bit obsurd but it may actually work. If anyone has tried this subjob out and has any input on it please e-mail me, The_Rice_Paper@Hotmail.com, thank you very much. All other subjobs I disregarded due to them not being worthwhile. As for an overall opinion I believe do whatever works for you, I pointed out as many strengths and weaknesses I could. 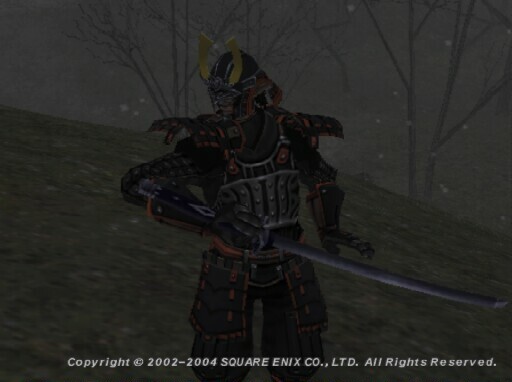 It's your choice to choose the way to play Samurai and be Samurai. I can say, I point to your destiny, but it is your duty to see your own destiny. Myochin Kabuto: The MND on our Kabutos affect the elemental damage from our WS. More MND means more chance of landing and more damage from the WS. The additional effect on "Meditate" will occasionally add 20-60 TP when using Meditate. Myochin Kote: Well these are actually very useful, and I would recommend using them rather than Ochiude's Kote(if you don't have the gil). Having 4 DEX bonus which is 2 STR and 2 ACC, and the additional effect when using "Rice Balls" will add to Samurai's Atk, Dex, Agi, and enhances Double Attack(occur more often), which can be a very good alternitive than 600k(Odin) worth of gloves. Myochin Haidate: It has 3+ STR and increases Samurai's parrying skill +5, Also has some good Def and HP bonus'. Most Samurai even past 70 still choose to use this. Myochin Sune-Ate: Extra Defense and HP, with the additional Enmity+5 when trying to steal hate in bad tanking situations. The +5 Evasion can come in handy when pulling and missing attacks made by the mob when temporarily tanking. The new SAM JSE Hachiman set is awesome, in some aspects. 1. The STR bonuses are great. 2. The WSacc bonuses are great. 3. The StoreTP bonuses are incredible. The truth is SE made this specifically for /rng or switching equipment in and out from SATA. The WS of GKT that heavily rely on STR (70-85%) must be balanced by ATK (15-30%) which this does particular set or equipment does not. Haubergeon on the other hand does, with 5 STR and having 10 ATK balance it evenly. Along with the 5 DEX and 10 ACC balancing it out. The Hachiman set will also minus regular ACC, since it is just WSacc. Infact ACC is still the same WSacc and helps your WS connect, just does not minus regular hitting. SATA will help balancing STR out since it does give you an ATK bonus for the next attack. Simply I would only suggest this for /rng and switching in and out of SATA until you are able to obtain a Kirin's Obsode. The more STR/DEX you have, it will increase the percentage available before ATK/ACC is capped onto certian mobs... or will make the cup bigger enabling you to have more water in it. The larger cup you have the more water can be put in before it overflows... or the more STR/DEX you have, the more ATK/ACC can be added before it caps.